How long have you practiced Yoga? How often per week? I have practiced yoga off and on for about 20 years. I currently practice about once a week. What made you decide to practice Yoga? I thought it looked interesting and could be a good workout. The instructors usually had nice muscle tone, great posture and confidence and I wanted all of those. 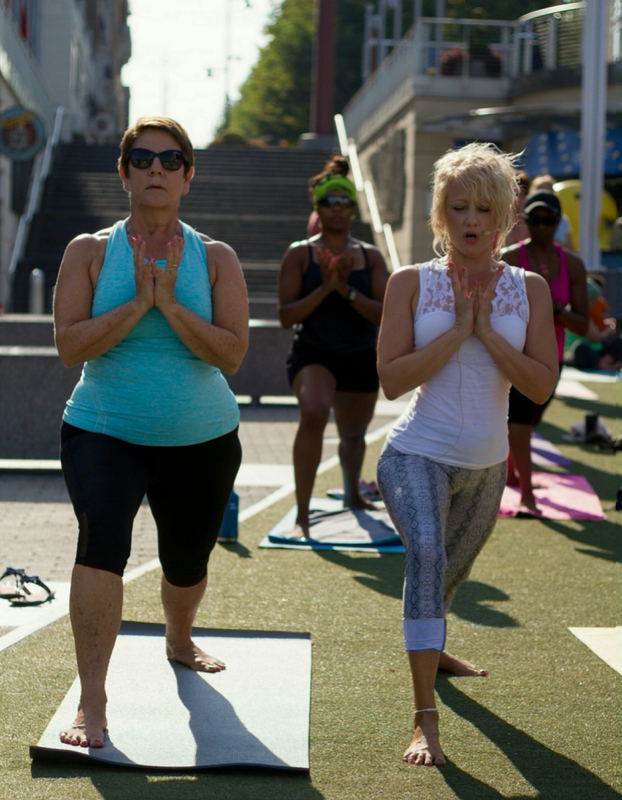 What do you like about practicing Yoga at National Harbor? I like being outdoors and having a large venue so we don’t get in each other’s way. The music is a wonderful addition and the view of the water is soothing. What is your favorite Yoga pose and why is it your favorite? I have 2 favorite poses – chair and warrior 1. I love how powerful my legs feel in both poses. Happy baby is another favorite as it makes my hips and lower back feel so good. I usually just want to laugh when I’m in it because I think of a tiny baby grabbing its feet and giggling. Describe how Yoga has enhanced or changed your life. Yoga has improved my muscular strength and flexibility. Having degenerative disc disease, I used to have a lot of back pain, but yoga has taken most of that away. It has also given me confidence and peace. If I’m having a stressful day, after my practice the stress is gone and my mind is clear. I’ve learned to be more open and non-judgmental. How long have you practiced Yoga? How often per week? On and off for about 5 years. At my peak, twice a week. What made you decide to practice Yoga? To relax! I am on the go a lot and was not paying attention to my body. I started feeling really tight and getting a lot of little aches and pains that I did not want to use over the counter meds to “fix”. 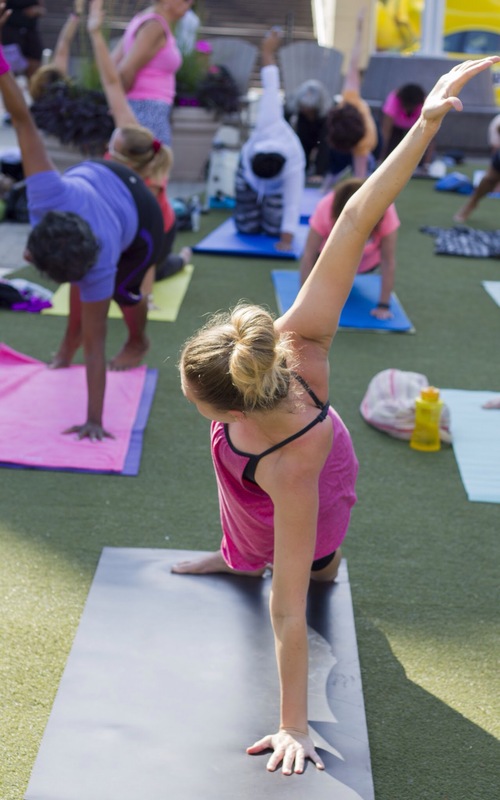 What do you like about practicing Yoga at National Harbor? The view! It’s a beautiful space and great atmosphere. What is your favorite Yoga pose and why is it your favorite? I enjoy the Sun Salutations. I like the flow of the movements and using my breath. Describe how Yoga has enhanced or changed your life. As a dancer and dance teacher, as well as working a full time sedentary job, I’m always on the go! Yoga gives me the opportunity to turn my mind off and check in with my body. It has helped with my anxiety and gotten me to focus on being in the moment! Inspired Yogi- What’s Your Story? How long have you practiced Yoga? How often per week? I’ve been practicing yoga on and off for two years. What made you decide to practice Yoga? I’ve been a dancer since the age of five and retired from dancing in the NBA two years ago. Yoga is a great alternative to dance and helps me maintain my flexibility. 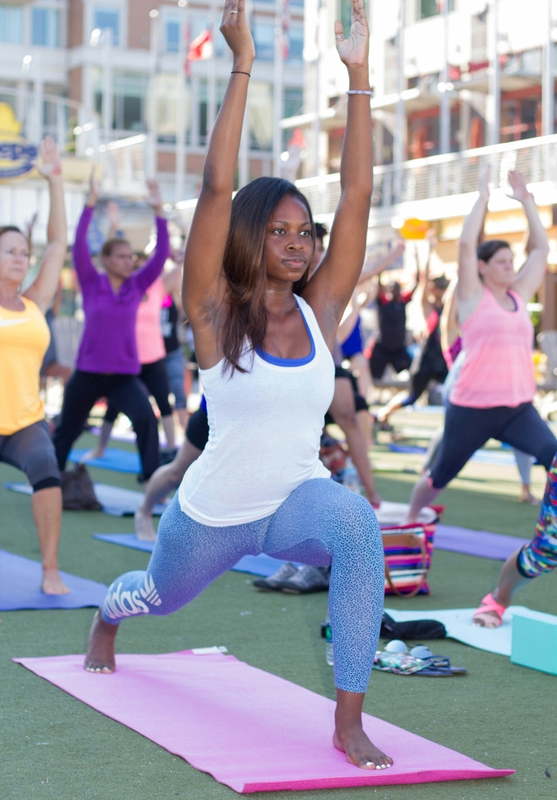 What do you like about practicing Yoga at National Harbor? 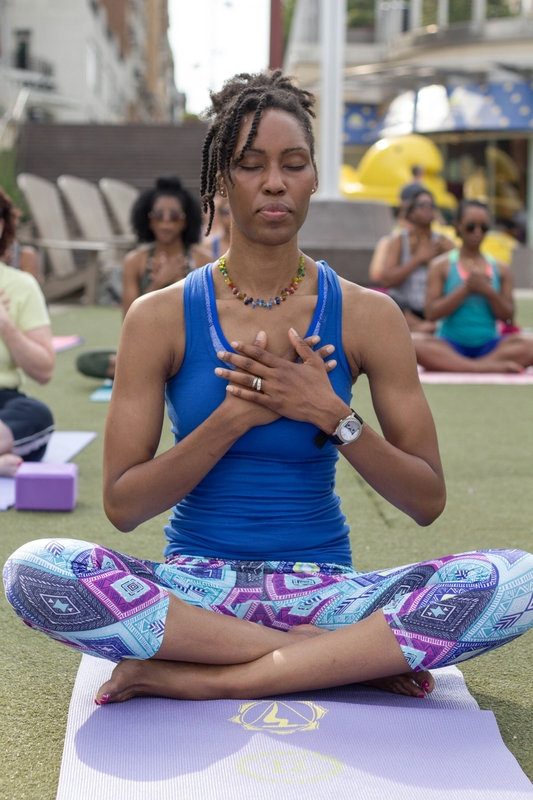 Practicing yoga at the National Harbor is a great break away from the typical studio class. Being outdoors with a clear view of the water adds to the relaxation aspect of yoga. What is your favorite Yoga pose and why is it your favorite? Airplane is my favorite yoga pose. It takes focus, balance and strength to achieve. Describe how Yoga has enhanced or changed your life. Yoga has helped improve my relaxation. It’s given me techniques to better my breathing and clear my mind. The strength and flexibility I have gained has also helped diminish my day-to-day pain. How long have you practiced Yoga? How often per week? I’ve known and attended yoga classes here and there over past decade, but it wasn’t til last year that I became a serious Yogi. I’ve acquired a 200 hour certification via Spiritual Essence Yoga studio and am now practicing at least 4-5 times a week. What made you decide to practice Yoga? Physical and mental health sustainment. of outdoors; being neat water. What is your favorite Yoga pose and why is it your favorite? I honestly don’t have a favorite. I am in appreciation of what they all represent in practice. I aspire towards holding crow pose for 5 breaths and to do a full handstand. Describe how Yoga has enhanced or changed your life. It has brought an understanding of the journey/pathway to peace and acceptance. How long have you practiced Yoga? How often per week? I have practiced for several years. I try to do a quick session at the end of each day. Sometimes I can squeeze one in during the morning as well. What made you decide to practice Yoga? I tried it once and enjoyed the feeling of relaxation. 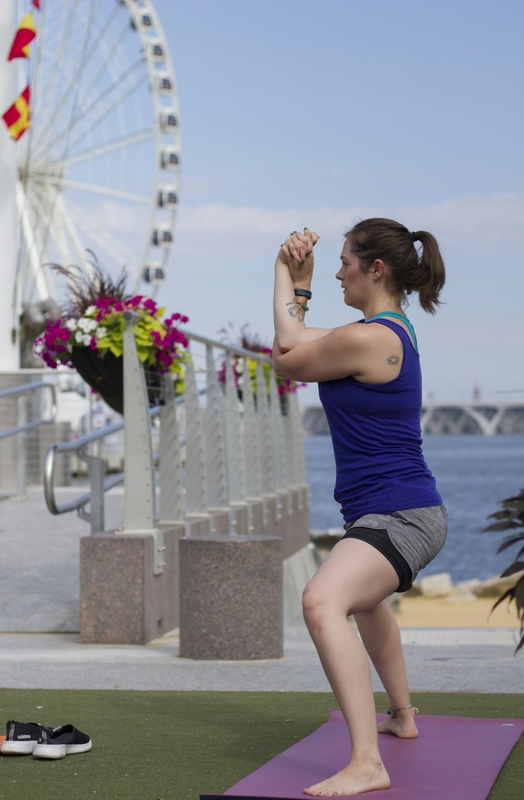 What do you like about practicing Yoga at National Harbor? The area is perfect. The water is beautiful, the turf is comfortable and spacious and the diversity of yogis is wonderful. The music is fabulous; the whole vibe of being outside in the sun feels great. What is your favorite Yoga pose and why is it your favorite? I like the child’s pose because it stretches my core and feels so relaxing. Describe how Yoga has enhanced or changed your life. Yoga has helped me calm my thoughts and release stress. I can be a pretty anxious person, and yoga helps me to temper that. How long have you practiced Yoga? How often per week? I have practiced yoga inconsistently for many years, but never stuck with it long-term. This summer, I started an exchange with a yoga studio and am attending classes 1-3 times a week in an effort to commit to a continuing personal practice and progress as a beginner. 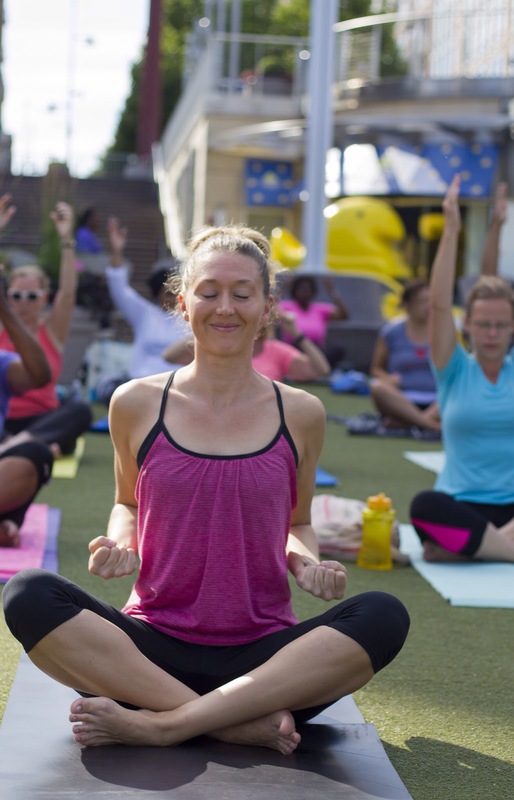 What do you like about practicing Yoga at National Harbor? Having just visited for the weekend (and on my 31st birthday! ), it was lovely to be outdoors in a new yoga environment and start off the morning with purposeful reflection and movement as I began the next year of my life. What is your favorite Yoga pose and why is it your favorite? 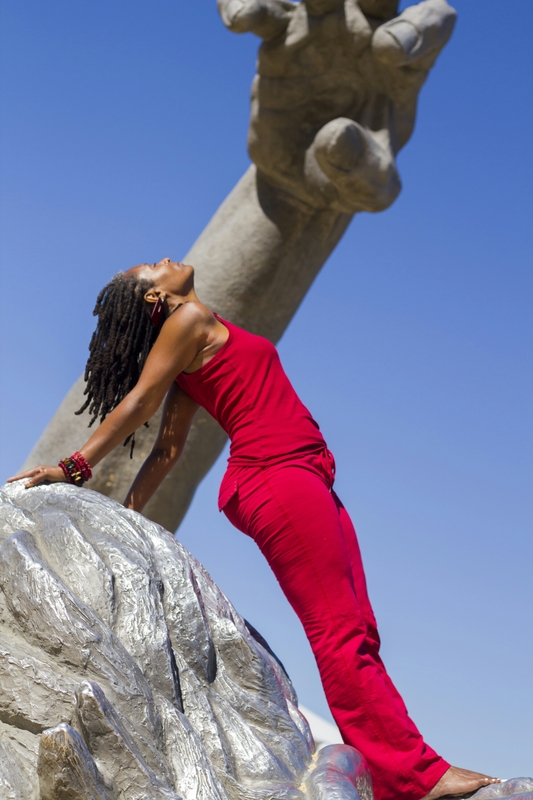 There is something about reclining goddess pose that is just the pinnacle of full physical, mental, and emotional centering for me in my restorative practice. The thigh stretch and hip-opening feels perfect every time. Describe how Yoga has enhanced or changed your life. Every time I successfully complete a yoga class, I walk away feeling stronger in body and mind. Though it is challenging for me physically, it is quickly shaping my idea of the kind of person I want to be and how I want to live my life. What made you decide to practice Yoga? I was a runner and started experiencing quite a bit of knee pain. I kept hearing over and over again that yoga could help with that and in general was great for runners. Turns out they were all right! 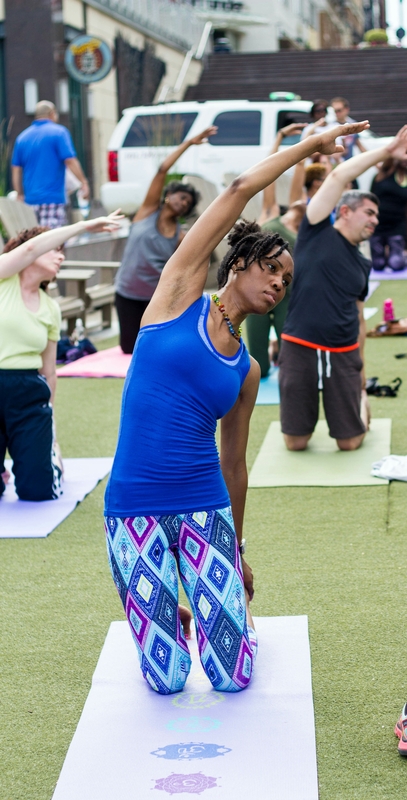 What do you like about practicing Yoga at National Harbor? This was a first time experience for me. I live out of town. I was having a girls’ weekend with my sister and we thought it would be an amazing way to start our Saturday morning and her birthday! What is your favorite Yoga pose and why is it your favorite? I love tree pose! It’s one of those balancing poses that makes you feel grounded and strong. You feel invigorated in the pose and it brings you to a place of concentration, focus and peace. Describe how Yoga has enhanced or changed your life. From a tangible aspect, yoga has definitely helped alleviate my knee pain while running. However, it has been much, much more than that for me. It has been empowering and has taught me that I can accomplish things I otherwise wouldn’t have thought I could do. It has also given me a place to let go of and work out Lifes little obstacles. When I’m on my mat it is truly a place of peace and happiness! How long have you practiced Yoga? How often per week? 12 years. Five to six days per week. What made you decide to practice Yoga? In 2004 I gave birth to my first child and wanted to find a form of exercise to help lose the extra weight from pregnancy and nursing so I attended my first Bikram yoga class in Alexandria Virgnia with my best friend. I was hooked from the moment I walked into the hot room. 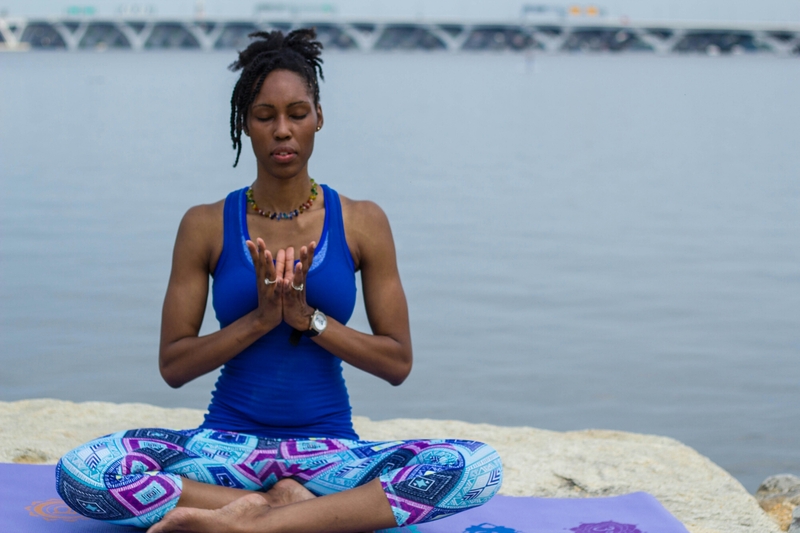 What do you like about practicing Yoga at National Harbor? It is so relaxing and peaceful to practice outside near water. Looking up to the sky, I really feel one with nature. What is your favorite Yoga pose and why is it your favorite? My favorite pose is Bridge because it is really challenging for me. Once I achieve it, I never want to come out of it but I mentally dread each time that I need to prepare for it. Describe how Yoga has enhanced or changed your life. It has helped me calm my mind and focus on the important aspects of life. How long have you practiced Yoga? How often per week? I’ve practiced yoga off and on for a few years with no consistency. Within the last year my practice has grown and developed and now I practice almost daily. What made you decide to practice Yoga? I am an athlete and I really needed a more structured stretching routine. 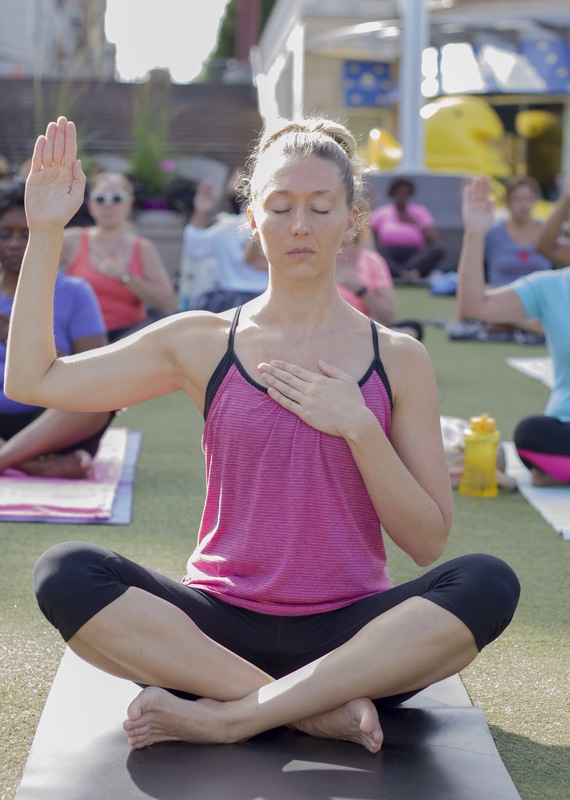 What do you like about practicing Yoga at National Harbor? I love being outdoors. I feel like it really enhances my practice. What is your favorite Yoga pose and why is it your favorite? Pigeon pose and its variations is my favorite. It is a really great hip opener and stretch. Describe how Yoga has enhanced or changed your life. I am a much happier person. How long have you practiced Yoga? How often per week? I’ve been breathing fully and downdogging off and on for years, twice a week for the last three years and recently (since April), I’ve committed to practicing 4-6 days a week. What made you decide to practice Yoga? I’ve been drawn to Yoga for as long as I can remember. Growing up dancing and playing sports, the stretching and strengthening aspect is naturally what attracted me to yoga. We were practicing this ancient movement without even being told it was yoga as asanas often were incorporated in our warm up and cool down during practice. As an adult, I welcome the wellness benefits from focus to mental and physical balance, to oxygenating the cells, and invigorating the organs, to maintaining good circulation and metabolism and increasing energy and vitality. 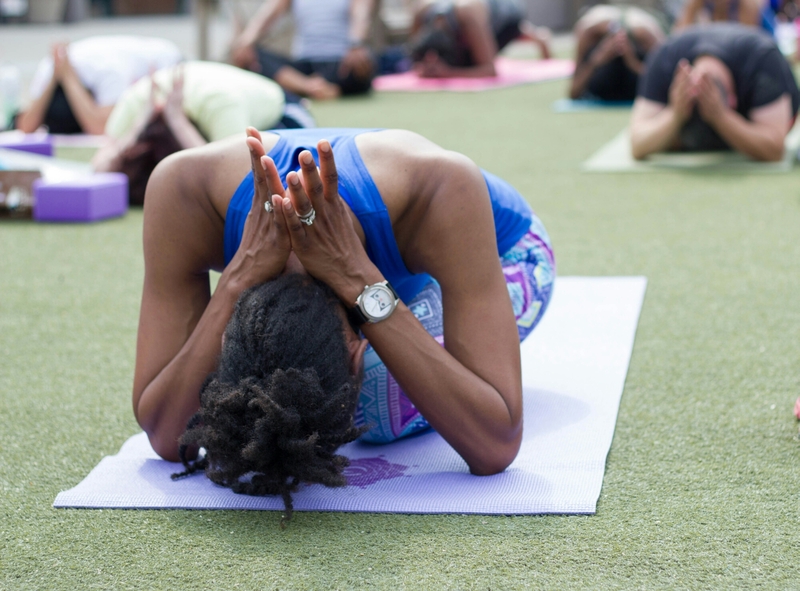 What do you like about practicing Yoga at National Harbor? I love that I can get an extra oxygen boost being outdoors, feeling the earth beneath me and seeing the sky above me. Plus with the water nearby, it’s so peaceful. Then there’s the drumming, the inspirational music, the fellow yogis and of course Cathy that all make it rewarding. What is your favorite Yoga pose and why is it your favorite? I can’t definitively choose one because they vary depending on how I’m feeling or how a particular asana inspires me while I’m doing it. Sometimes it’s adho mukha svanasana (down dog), sometimes uttanasana (forward fold/bend), or poschimottanasna (seated forward fold/bend) or salamba bhujangasana (sphinx); sometimes it’s one of the warrior poses or utkata konasana (goddess asana). This week it’s virabhadrasana III (warrior 3) because it reminds me of my fierceness, focus, and strength, yet how i can find softness through my breath and the juxtaposition of them to find balance and peace. Describe how Yoga has enhanced or changed your life. Yoga helps me to find calm in the mist of calamity; it helps me to let go of trivial and petty thoughts and embrace others; it helps me to know that the wisdom we share with each other helps increase our collective knowledge, but I’m still a work in progress! How long have you practiced Yoga? How often per week? I have practiced for about one year casually. In the last few months I have sparked my practice to a daily routine. What made you decide to practice Yoga? I love yoga for the stillness it brings to my mind and body. It slows down life and brings me to the present. I am athletic and depend on the physical practice to strengthen and prevent injury. The mental focus helps in every aspect of life and those I love around me. 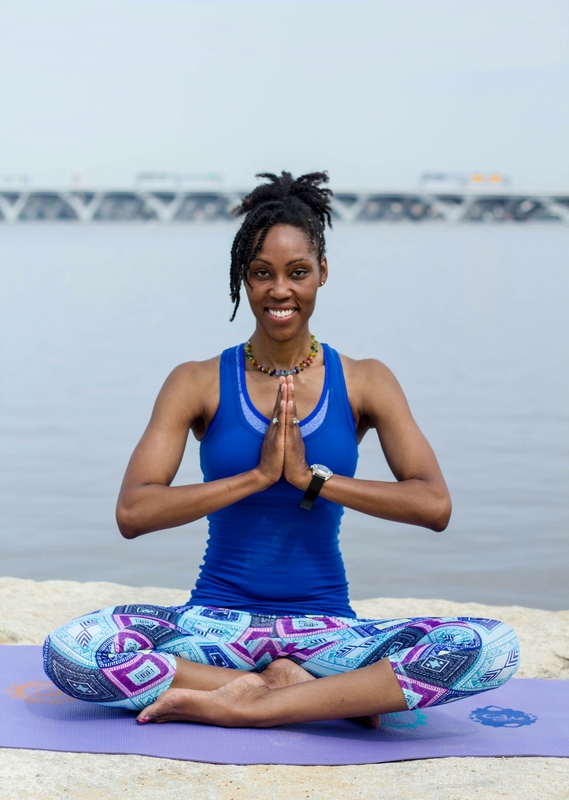 What do you like about practicing Yoga at National Harbor? I love being outdoors under the beautiful sky. There’s is nothing like feeling a breeze or the touch of the sun on your skin when practicing. What is your favorite Yoga pose and why is it your favorite? Tree, vrksasana, is my latest favorite because it took time to develop. I love how it strengthens the legs and opens the hips. Grounding stability feels great to accomplish. Describe how yoga has enhanced or changed your life: Yoga brought light back to my life. I regained control of my mind and body. How often are we attune with our breath; which is connected to our mind and entire being? Checking in on yourself let’s you place your energy and focus in a positive way. Ground, grow, light, and love. Inspired Yogi – What’s Your Story? How long have you practiced yoga? How often per week? Well I have attended classes through out the years….but I’m just now getting consistent with it. What made you decide to practice Yoga? I needed some me time…away from everything else. I wanted to focus on just me. 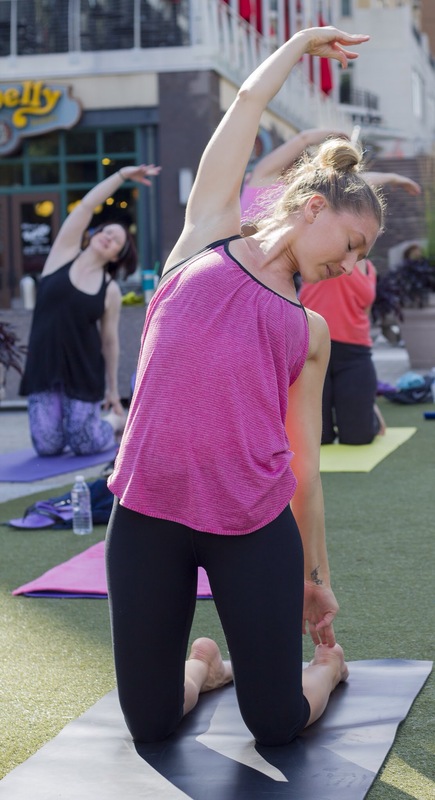 What do you like about practicing Yoga at National Harbor? The open area…the exposure to nature, and meeting new people. What is your favorite Yoga pose and why is it your favorite? I am just now learning the yoga poses….. so I don’t have a favorite yet. I enjoy the poses that give me a good stretch or help me feel relaxed. Describe how Yoga has enhanced or changed your life? It helps me to focus on myself. I am able to analyze different things in my life, visualize how to improve aspects of my life and enjoy each moment.